“I felt nothing, remembered nothing. Just exhausted,” recounted Qizhan, a Taoist spirit medium from the Tao Bu Keng temple, which is nestled amongst the old estates of Teck Whye. 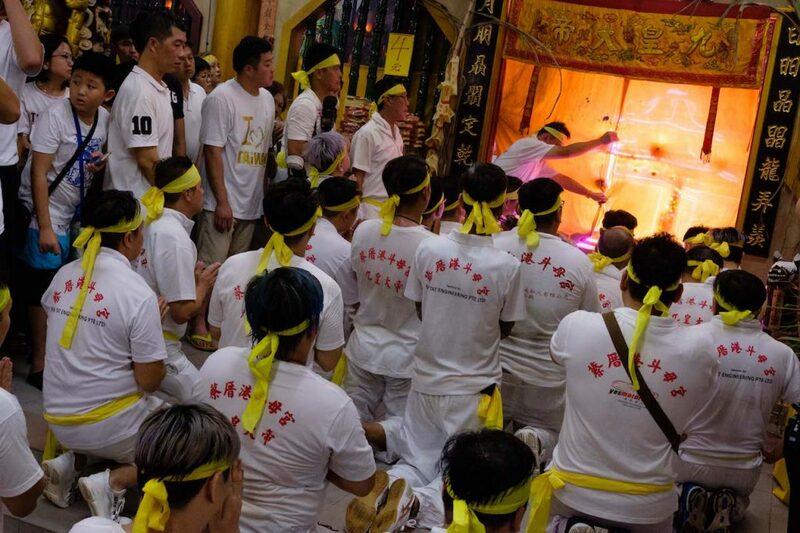 As we sit in the temple’s grounds on a late Saturday evening, talking about his journey as a spirit medium, temple volunteers are buzzing all around us, working tirelessly in preparation for the coming Monday—the first day of the Nine Emperor Gods Festival. 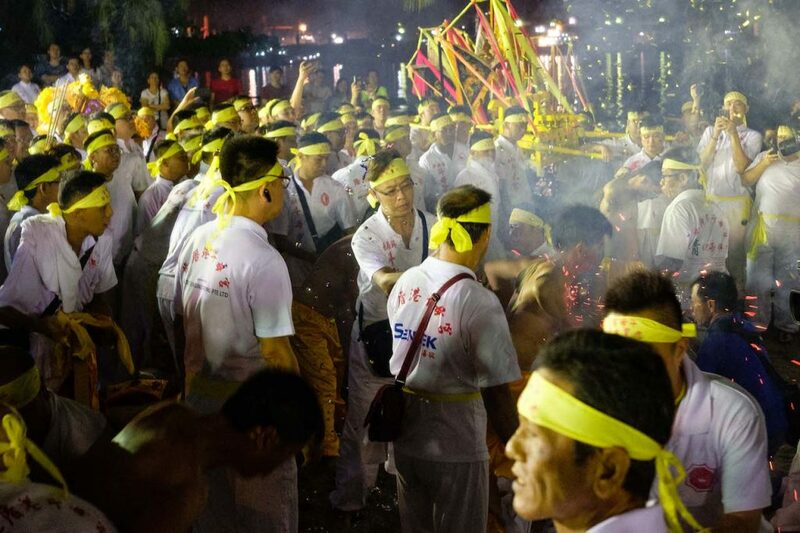 Not long after, Qizhan had to excuse himself for a traditional procession that must be performed as preparation for Monday’s ritual. “People usually witness strange occurrences when they are watching a spirit medium. 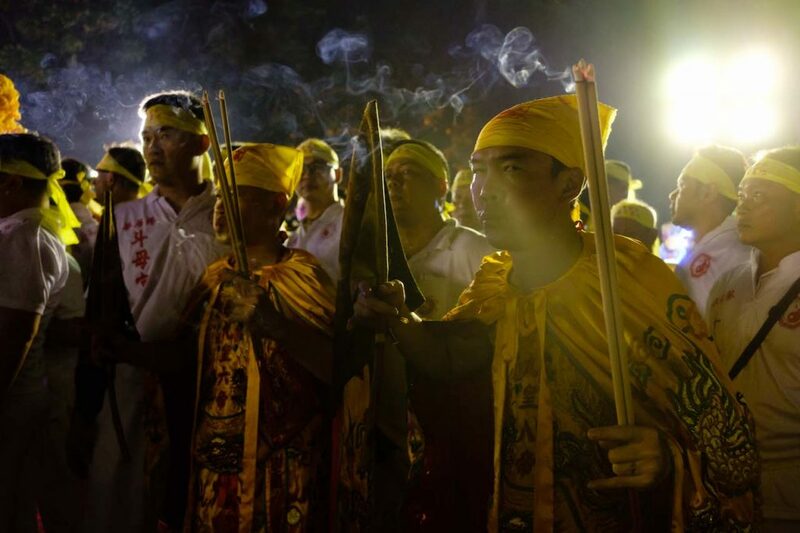 It’s better to pray to Jiu Huang Da Di with the joss sticks before watching the ritual,” forewarned Qizhan before we parted ways so he could get ready for the procession. Bearers of the palanquins doing the final preparation and fixes before Monday’s ceremony. Worshippers preparing for a procession called ‘安五营’, the invitation of the Fifth Nine Emperor. 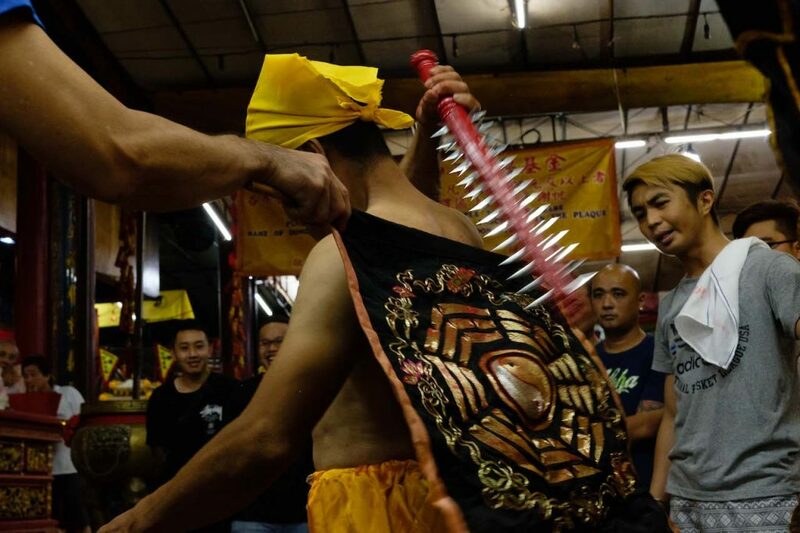 The Nine Emperor Gods Festival is a nine day long festival that is held from the 1st to the 9th day of the ninth Lunar month, in accordance with the Chinese calendar. Numerous versions of the story of the Nine Emperor Gods exist, with each community and temple differing from each another. 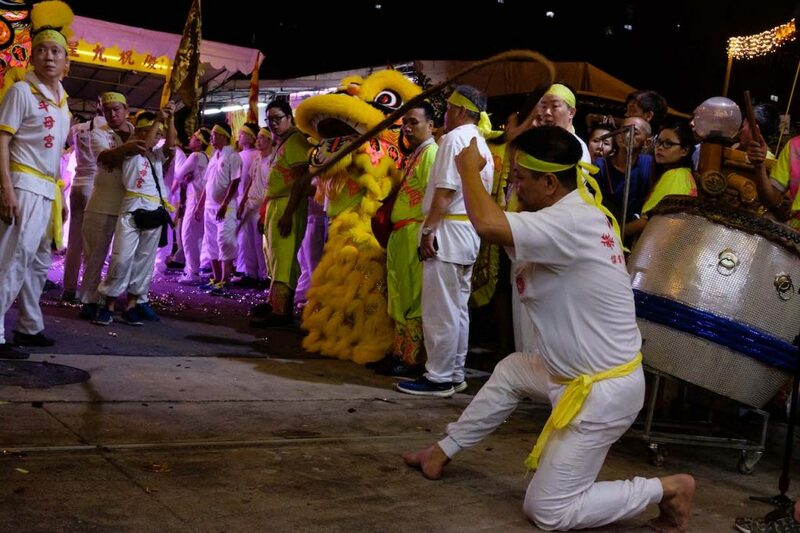 According to an early written account, however, the festival of the Nine Emperor Gods dates back to the end of the Han dynasty. 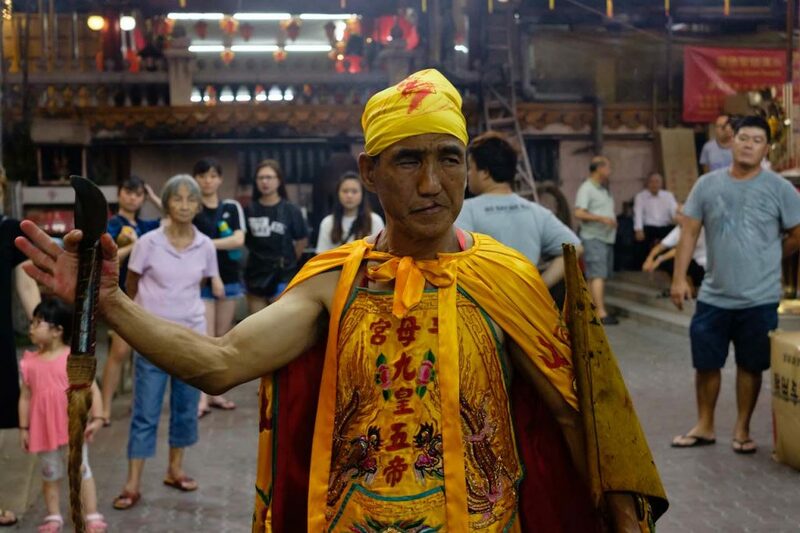 According to this account, the reigning emperor was once suspicious of a Taoist magician, who was using charms and talismans to cure the ill, earning a great amount of wealth in the process. To teach him a lesson, the emperor ordered nine scholar-musicians to hide in a secret room where they would, at his command, begin to conjure sinister music with their instruments. This was to happen upon his invitation of the magician into the palace. 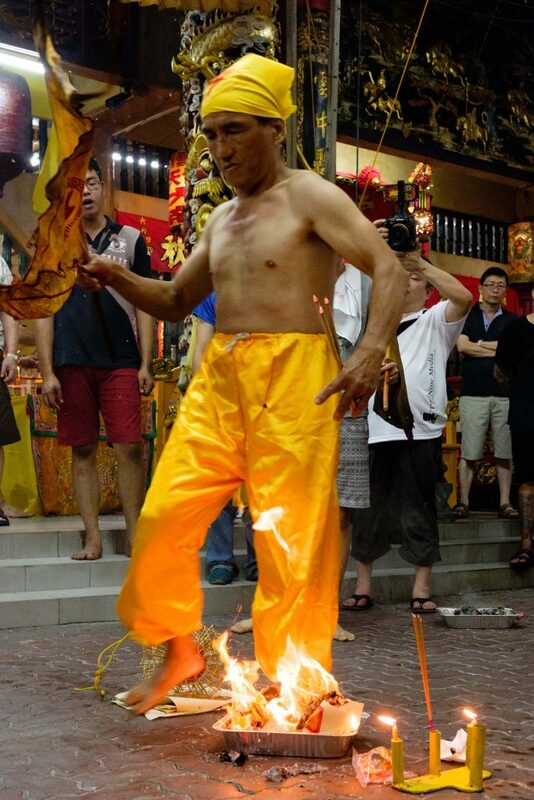 The magician, upon the request of the emperor, was then told remove the ‘evil spirits’ from the palace. When the magician saw the musicians through his magic fan, he gave a chop with his magic sword, and all nine musicians were beheaded. The emperor, fearful that the vengeful spirits would come after him, ordered the heads to be buried in a vase before it was sealed with talismans and prayers to prevent the spirits from escaping. It was then thrown into the sea. But it wasn’t for long that the emperor began to dream repeatedly of the nine, bloodied ghosts of the musicians, asking him to canonise them as the ‘Nine Emperor Gods’. 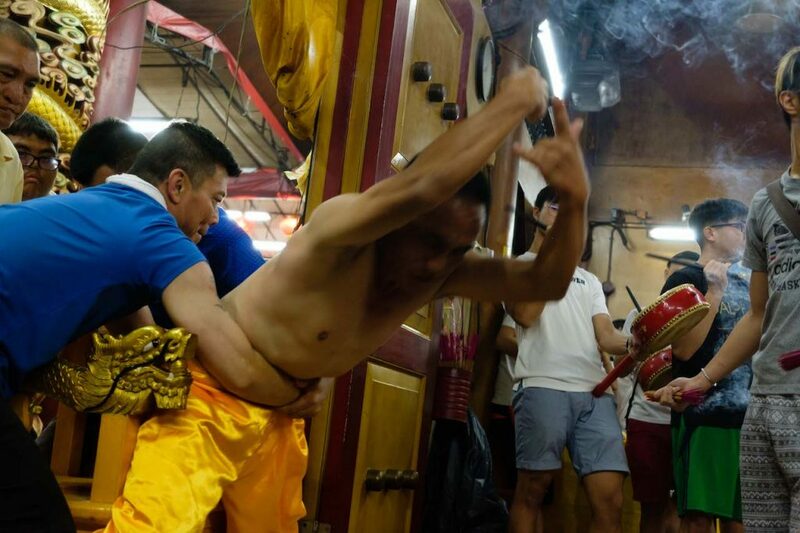 Qizhan going into a vigorous trance, taking in the spirit of the Fifth Nine Emperor. The Fifth Nine Emperor (九皇五帝). Volunteers crowd around the Emperor as he gives out advice and orders on the things needed for Monday’s ritual. One of many rituals that must be performed during the procession. 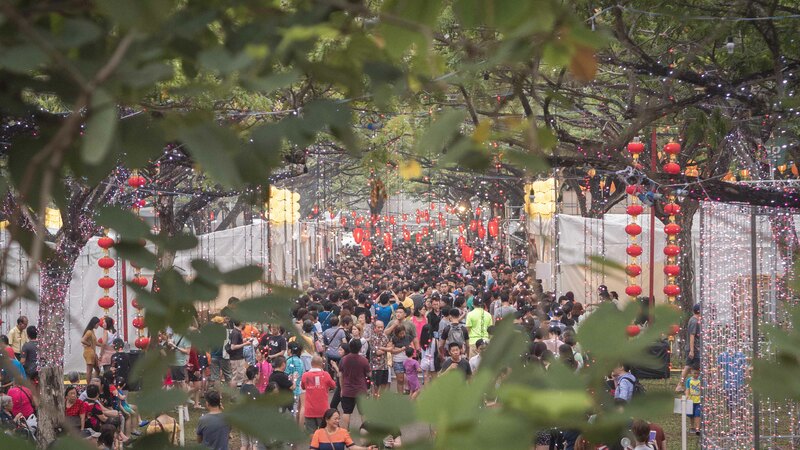 Prior to the welcoming ceremony on the first day, a procession called ‘安五营’ or ‘the setting up of the 5 camps’ is done to invite the Fifth Nine Emperor (九皇五帝). 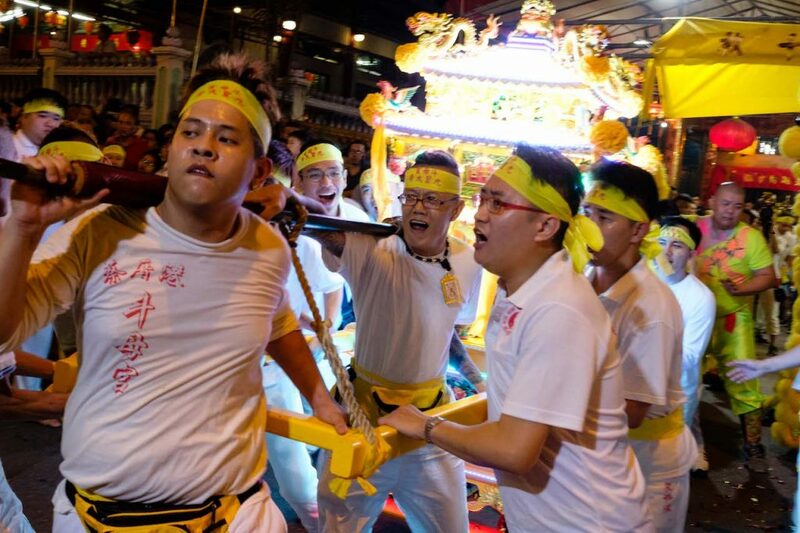 This procession calls upon the Five Direction Generals (五营将军) to take their positions in the temple, guarding it during the duration of the festival. 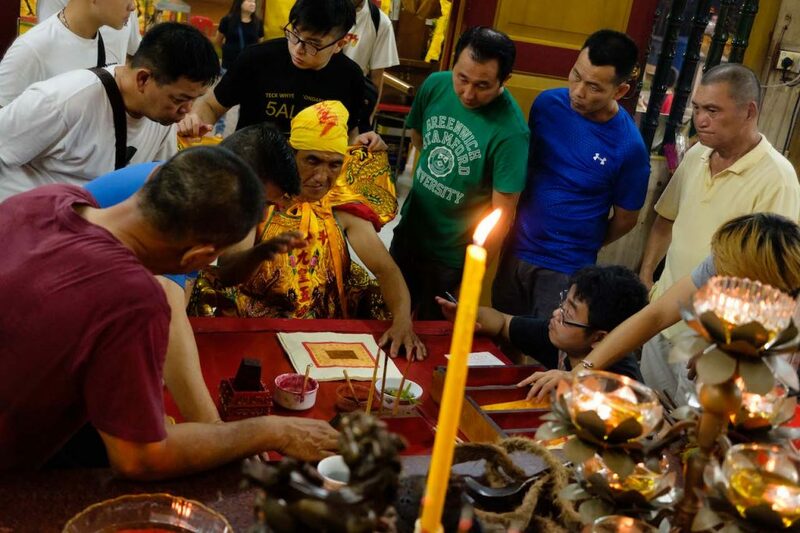 It is within the altar room of the temple, with the air thick with incense smoke that Qizhan, flanked by two followers, enters. 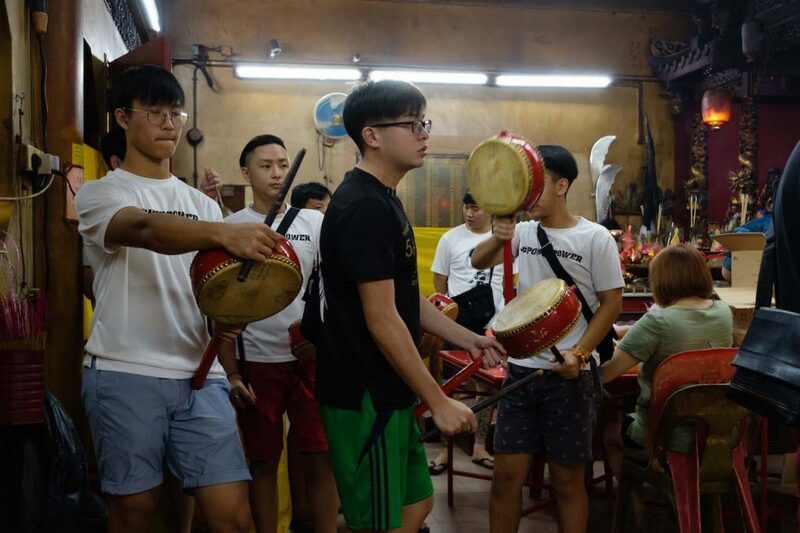 With a shout, the room erupts into a fast, thunderous rhythm of drum beats and gongs as Qizhan enters a vigorous trance, now embodying the spirit of the Fifth Nine Emperor. Throughout the night, the Fifth Nine Emperor dispenses advice and orders to the worshippers, inspecting the preparations, and performing rituals needed for Monday’s ceremony. 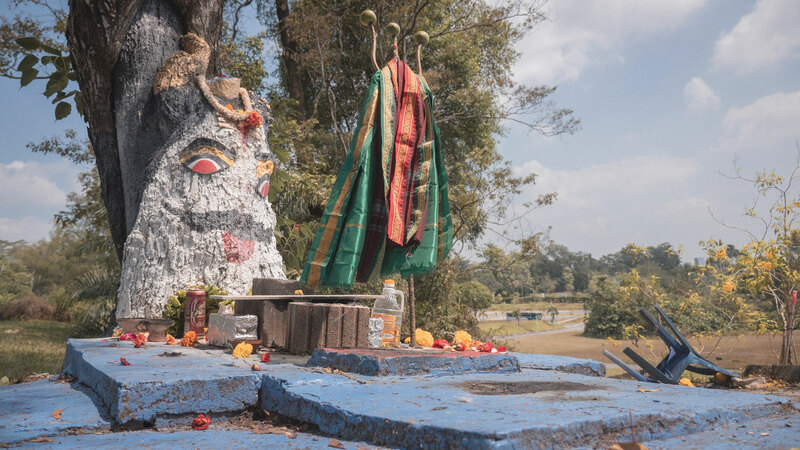 On the shores of Tuas South, where worshippers await the beginning of the ceremony. The altar of the ‘mother’ of the Nine Emperor gods (斗母元君); only women are allowed to carry it. Two of the Nine Emperor Gods stand watch, blessing worshippers as they await the the next rituals for the welcome ceremony. 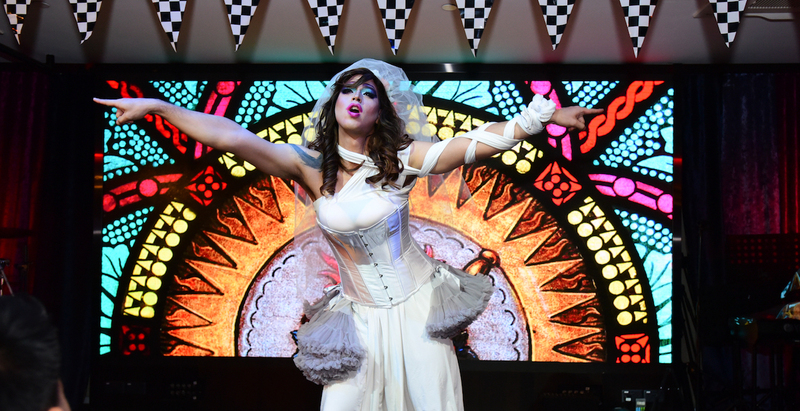 On Monday night, the festival begins in earnest. 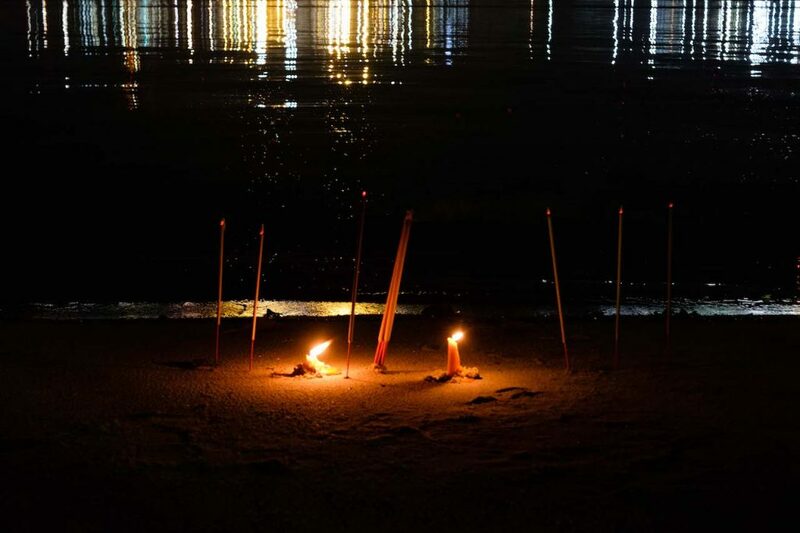 Hundreds of worshippers gather along a small beach at Tuas awaiting the arrival of the nine mediums to welcome the Nine Emperor Gods. 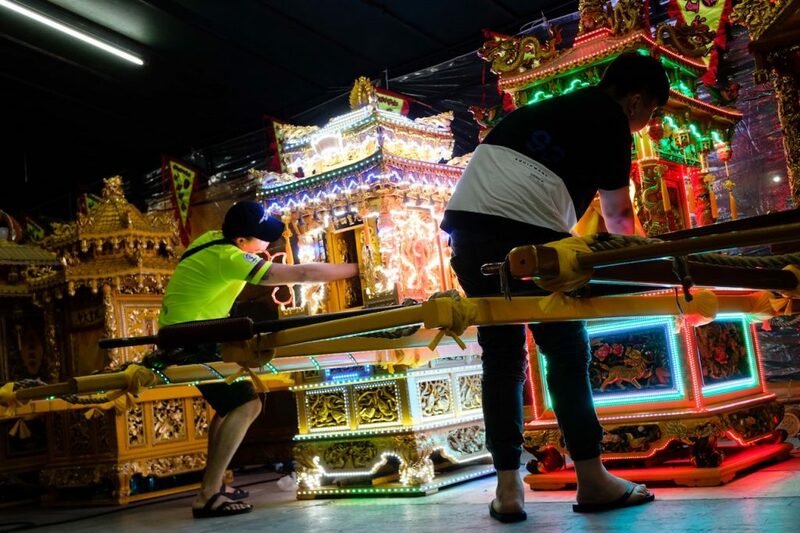 Amongst the worshippers are various palanquins, some lavishly tricked out in neon lights and beautiful intricate details, others small and simple, carrying statues and altars. Then, like the first onslaught of waves crashing upon a beach at high tide, the crowd ascends from calm into chaos at the deafening sound of drums and gongs, which announces the arrival of the nine mediums. 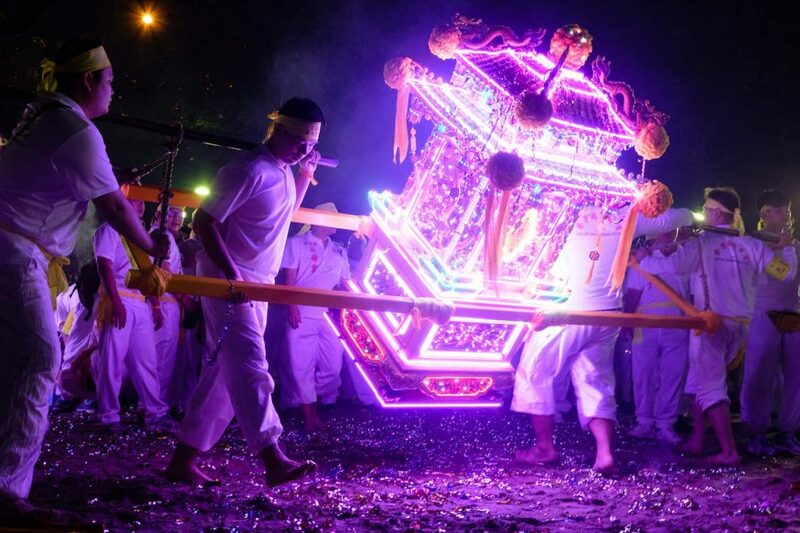 Party poppers burst into the air and bearers of palanquins begin rocking them side to side as the mediums, each one already in a trance, enters the beach front, taking in the spirits of the Nine Emperor Gods. The crowd continues its celebration as individual palanquins visit the altar to receive a holy artefact, to be placed in it for transportation back to the temple. 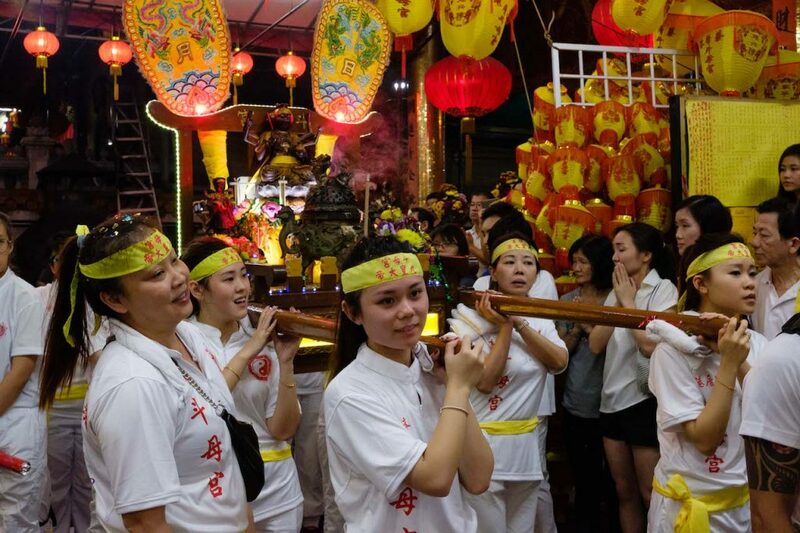 The Nine Emperor gods blessing worshippers as they arrive at the Tao Bu Keng temple. 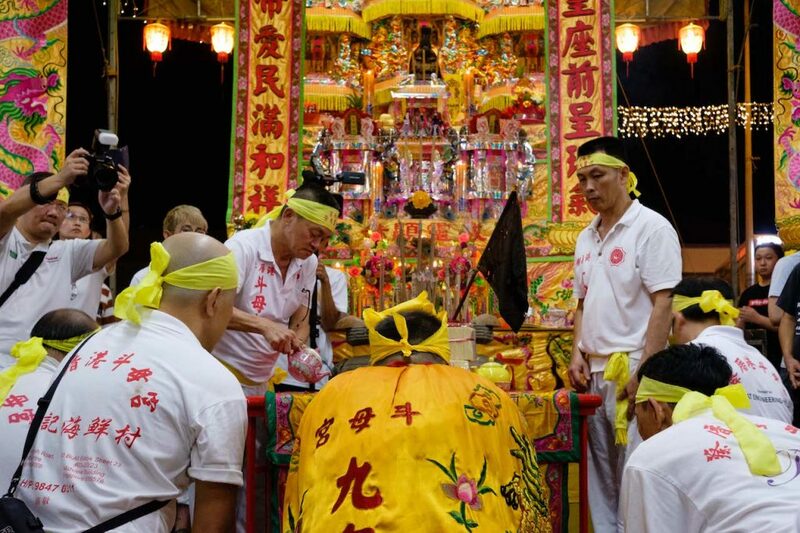 The bearers charging forwards and back as they receive one last blessing before entering the temple. 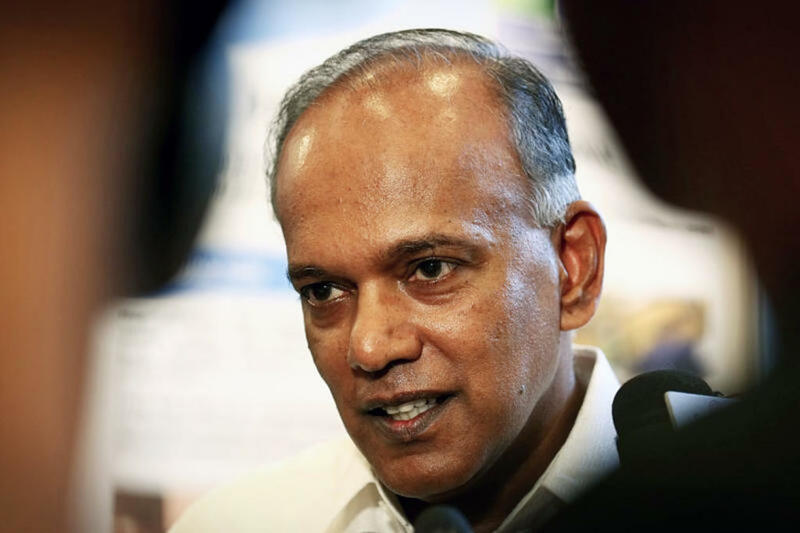 The whipping purifies the path to welcome the palanquins. Upon entering, the holy artefacts that are in the palanquin are removed behind closed curtains, away from the public view. The altar of the ‘mother’ of the Nine Emperor gods (斗母元君). 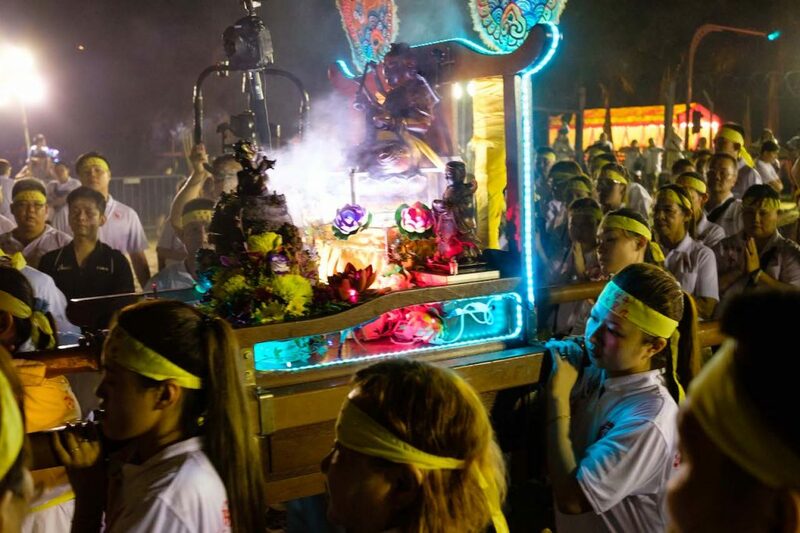 Amidst the jubilant roar of men, a small band of women, carrying the altar of the ‘mother’ of the Nine Emperor gods (斗母元君), makes their way to the beach front. Unlike the other palanquins, only women are allowed to carry the ‘mother’ as she is a goddess. 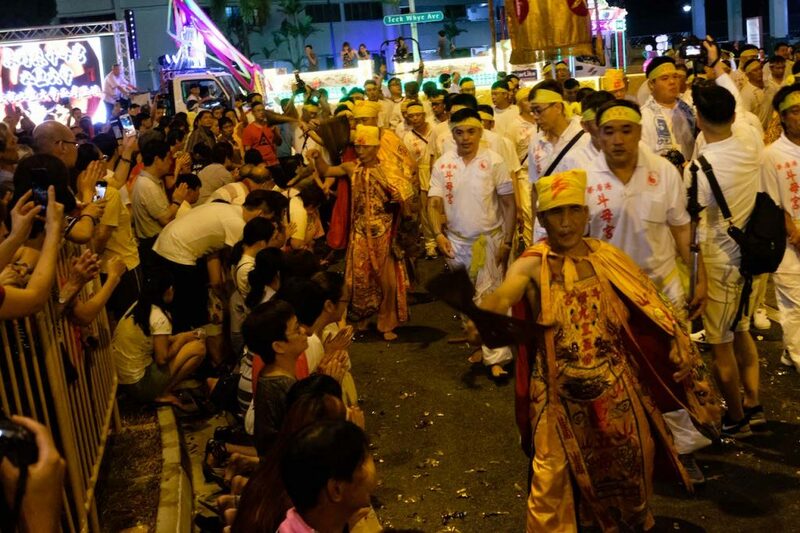 Eventually, after an hour, everyone begins making their way back to temple where preparations will be made to welcome the Nine Emperor Gods to the temple. 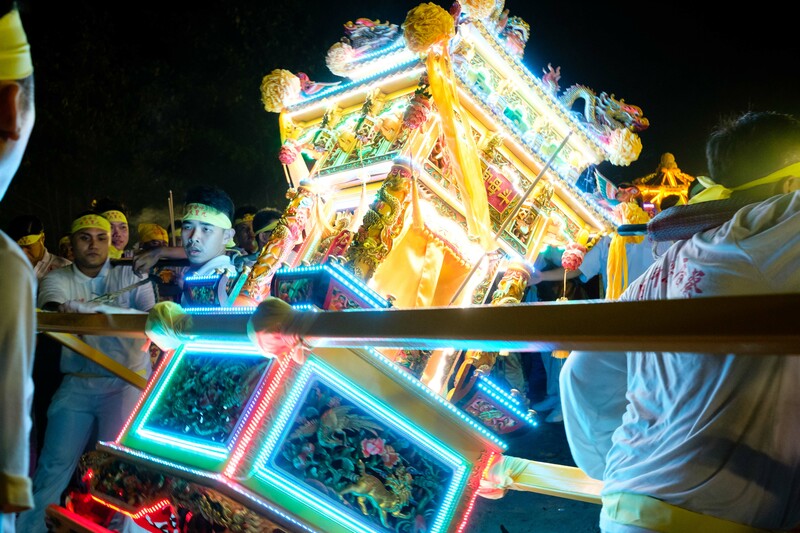 Another round of celebration ensues with worshippers cracking whips onto pathways, welcoming the palanquins and the Nine Emperor Gods. Bearers of the palanquins continue to vigorously rock their palanquins from side to side, receiving blessings from the Gods. 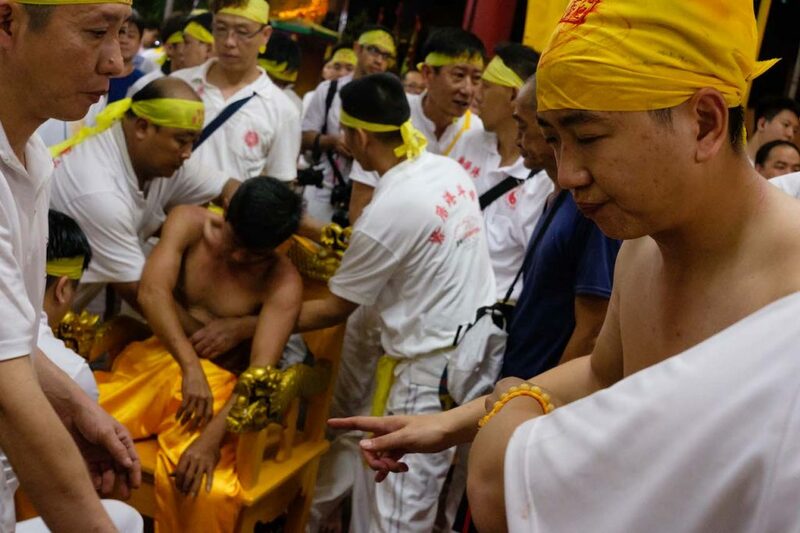 The final ritual before the spirits of the Nine Emperor Gods leave the bodies of the spirit mediums, returning them to normal. The final prayer as it marks the end of the welcoming ceremony. As the first day of the festival comes to a close, and mediums undergo one last ritual to return to their normal self, I can’t help but feel like I’ve swept off my feet; flowing amidst the fervour of worshippers. For now, the night is quiet yet again, at least until this weekend, when the next major part of this festival commences. What festival should we photograph next? Let us know at community@ricemedia.co.